It’s a pretty safe bet if a series opens on a plane, the plane is going down. This one goes down in Cleveland. Three beautiful middle-aged women, all familiar faces from earlier sitcoms, are headed to Paris for some gal pal time. The very first line speaks to the theme of body image insecurity. “Airplane mirrors aren’t accurate, are they?” asks Valerie Bertinelli’s character, Melanie. Her loyal friends are quick to assure here that they most definitely are not. The in-air conversation doesn’t get much more complex than that, but gives us a taste for each character. Melanie has written a book listing things a woman should do before she dies. She is going through a divorce, and hasn’t abandoned hope of a reunion, until finding out her ex is already engaged. Joy (Frasier’s Jane Leeves) is an eyebrow… um, stylist? And Victoria (Wendie Malick) is a longtime soap opera actress who loves being recognized. She’s basically her character from Just Shoot Me so we don’t have to work hard there. The joke is pretty simple. Women who feel old, fat, and ugly in L.A. can feel gorgeous in Cleveland. It’s a set-up for a million jokes, particularly biting if you happen to have traded a Midwest life for one filled with palm trees (and there are a lot of us). You know what’s coming; the women are amazed at real estate costs, at the attention they receive from men, at the fact that there are museums in Ohio! It’s easy to believe that Melanie instantly wants to set up home and hearth in the Buckeye state, especially when she points out that a month in the large 2-story house she’s renting costs the same as a night in a Paris hotel. What’s harder to buy is that her friends want to stay, too, and that the creators are going to stretch out that stay long enough to make a whole series. 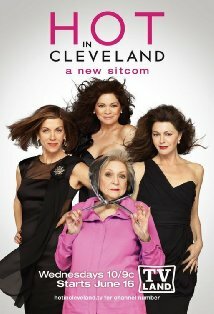 Basically, Hot in Cleveland doesn’t ask much of its audience but the situation in the pilot has built-in humor. I watched a couple other episodes, and it seems to evolve into just another show about single people trying to get dates. The pilot may have been the high point. This entry was posted in 2010s, Comedies and tagged betty white, hot in cleveland, jane leese, l.a., midwest, tv land, valerie bertinelli, wendy malick by meekthegeek. Bookmark the permalink.